Whether your are staying a few days or a few months, Home2 Suites by Hilton provides spacious and stylish suites while our community space offers guests a friendly and casual environment in which to work or play. At each hotel, you'll find services and amenities that emphasize convenience and customization which includes free Wi-Fi, free breakfast, multi-functional lobby, the Oasis, pet friendly, saline swimming pool, integrated laundry and exercise facility, patio grills, walking path, and more. 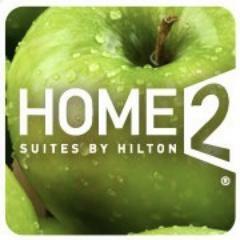 Come see what the buzz is all about at Home2Suites.com. Home2 Suites by Hilton®, one of the newest hotels in the Hilton Worldwide portfolio of brands, is an all-suite, extended-stay hotel ...designed for the savvy, sophisticated and economic traveler. The contemporary, comfortable and flexible suites welcome guests with style and consciousness that shows our commitment to being Green. We provide earth friendly products and services that you’ll feel good about while traveling. And no matter how long you’re on the road, you’ll always feel at home at Home2.